Question: What’s more entertaining than a bunch of drunk, toothless, cross-eyed Russians playing football with an empty bottle? 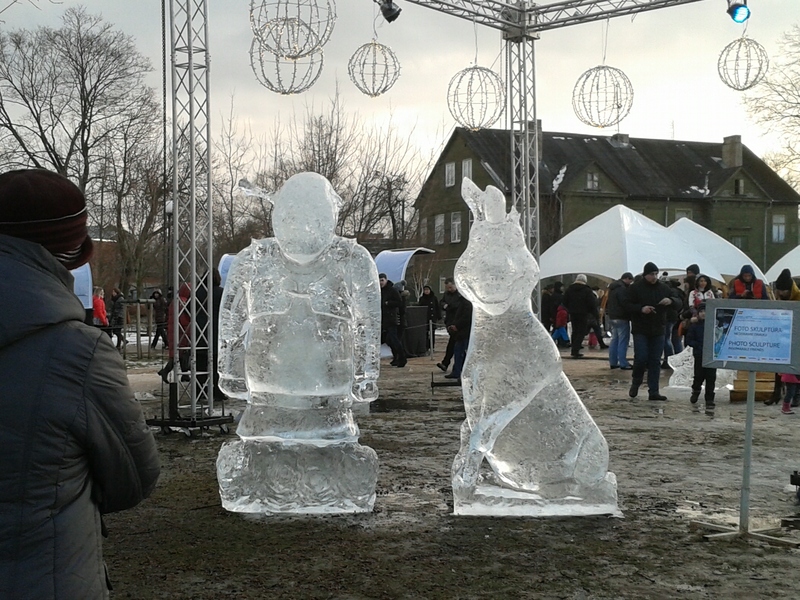 Answer: The 16th Annual Ice Sculpture Festival in Jelgava, that’s what! I found a seat on the train and looked up to find myself sitting opposite a man who was almost certainly a serial killer. He was accompanied by his wife (she could have been his mother – in Latvia, there’s usually very little difference anyway). She was sporting a rather eye-catching mole on her cheek that closely resembled a small hairy potato. It’s a wonder the other Latvians haven’t tried to eat her. I came to the conclusion that they were riding trains scouting for potential victims, or looking for potential places to bury said victims along the way. You can imagine my relief when I stepped off the train and into the waiting arms of Yummy Jānis. Jelgava is his stomping ground after all… convenient, right? 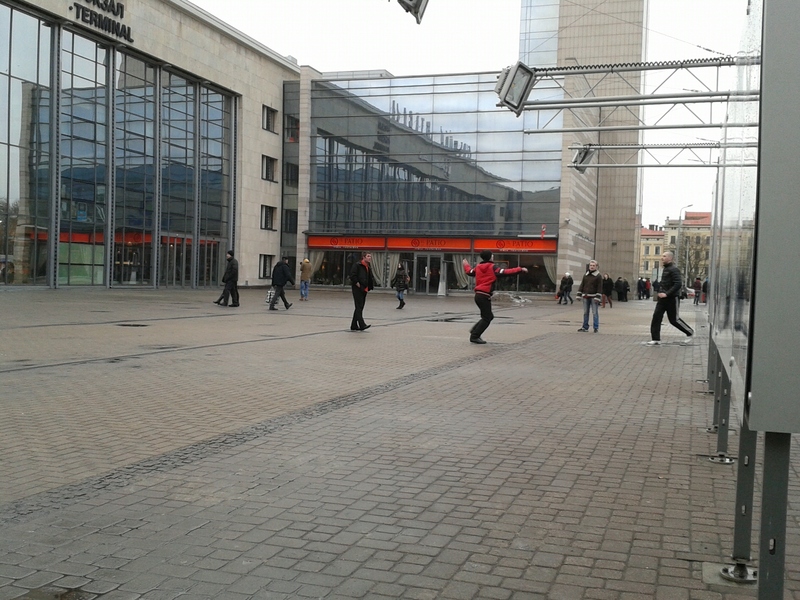 We made a beeline towards Uzvaras (Victory) Park where all the action was taking place. Tickets handed over and hands stamped with a large ‘K’ (no idea why), we walked into the park. I’m not quite sure what I was expecting but I guess it was something a little more spectacular and a little less soggy field. 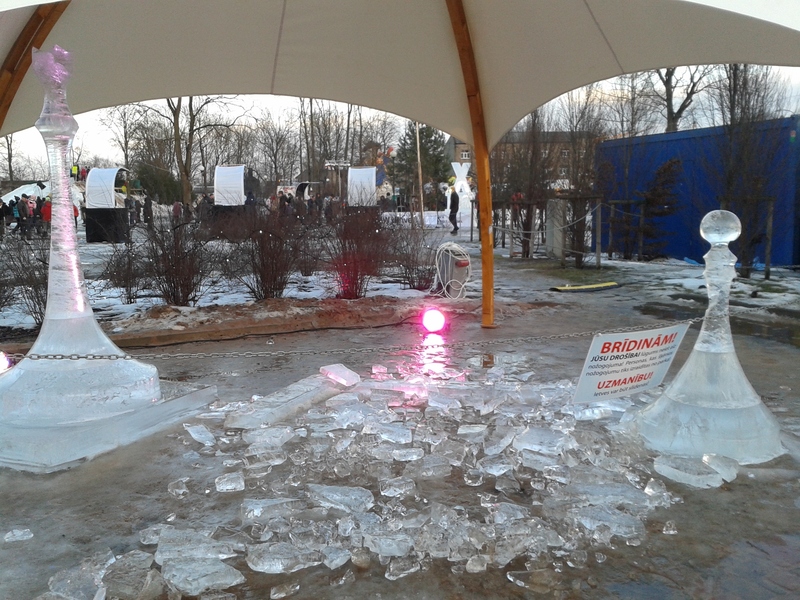 The problem was that the temperature was around +5 – unheard of for this time of year in Latvia – and while I’m quite happy with the mild winter we’re having, it’s not exactly ice sculpture-friendly. The theme of the festival was ‘Wonderland’ but really, it was a bit more like walking in ‘Woundedland’. Faces had melted off, limbs were missing and (what had possibly been) Alice from “Alice in Wonderland,” lay in large chunks of ice on the ground. Shrek and Donkey had fared a little better – although they were both missing an ear, there was an endearing lop-sided symmetry to it. One of the few pieces that was still intact was a rather lovely sculpture called ‘Moon Angels’, created by two Estonian sculptors. The angels still even had their wings attached which was a bonus. 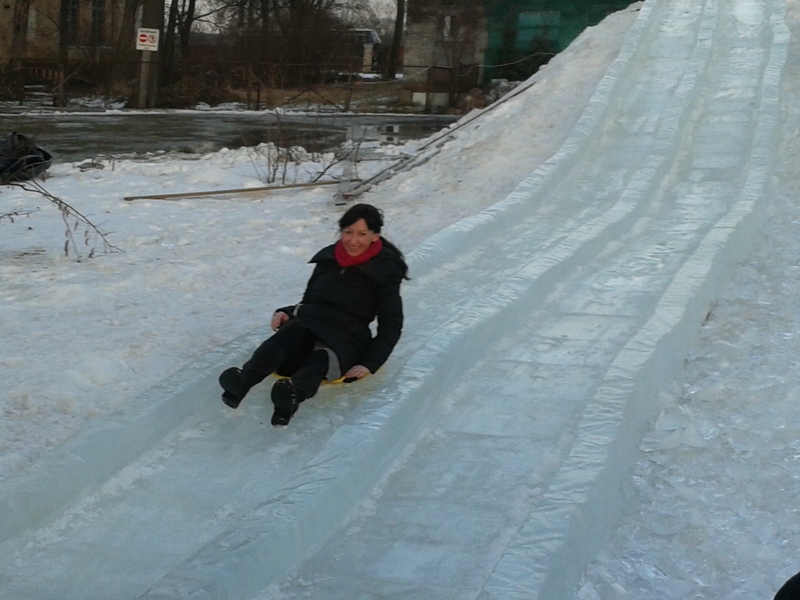 As we sloshed about through the puddles, mud, slush and sculptors’ tears, something caught Yummy’s eye – the ice slide. He steered me towards it with an enthusiastic ‘Ooh, let’s go on that!’ As we climbed the wooden steps to the top, I noticed (with my keen observational eye) that we were the oldest people there by 25-30 years. But hey, we were in this together, right? Wrong. Yummy went to the top of the queue to ask if adults could slide too. ‘Sure’, said the girl and then he was off down the steps again. ‘Wait, aren’t you doing it too?’, I cried plaintively. ‘No, I’m too big. Have fun!’ Hmm. I maneuvered myself onto a child-sized plastic tray with a lot of ungainly sliding around and, with a helpful push from the assistant, I was off – at about 4 km an hour. I hadn’t quite gained the momentum to make it past the flat middle section of the slide so there was some furious hacking at the ice with my heels, and futile clawing at the sides to try to get myself moving again. I eventually chugged to the bottom of the slide, feeling like a bit of a muppet, but unable to stop laughing. With my workout for the day taken care of, it was time for some liquid refreshment in the form of hot cranberry vodka from the rather cool Ice Bar. 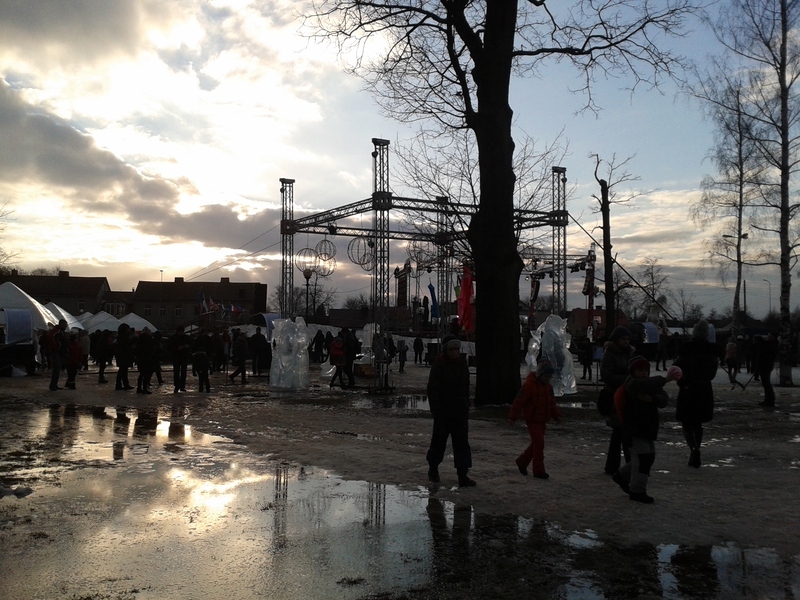 We then made our way to the ice sculpting demonstration which I’d been looking forward to – surely the ice would last long enough for the sculptors to hack it into some sort of shape? Thankfully it did, and this part of the day really did not disappoint. At this stage, my icy feet could probably have been sculpted so we decided to skip the rest of the action and head for home. After a stop-off at Yummy’s place so he could pick up the food he’d bought the day before (really?? ), and an additional stop-off at Rimi so I could buy a plate he could eat off (I’d broken my spare during the week), it was time to get the train back to Riga. Once at my place, I stationed him in the cooking position and settled in for the real show with a nice glass of wine. Related articles: You can also check out my journalistic debut (ahem) over at The Baltic Times. 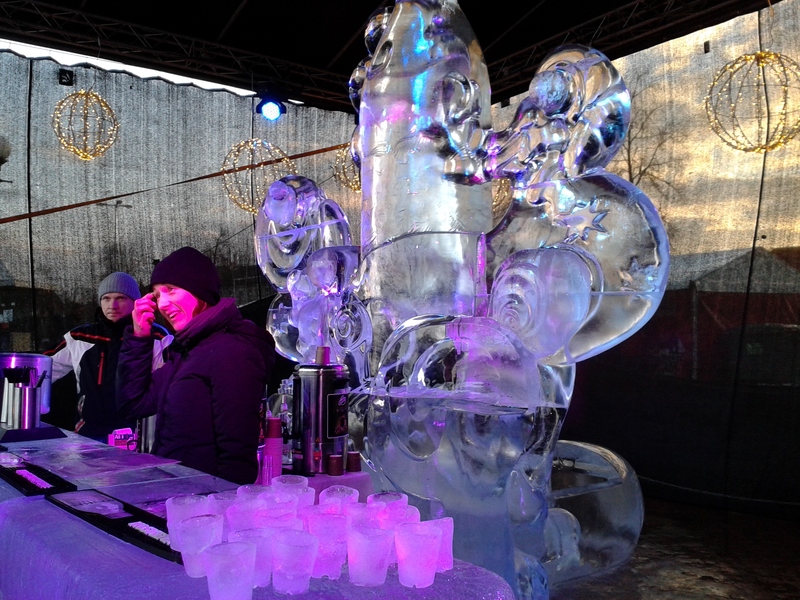 This entry was posted in Festivals, Food, Humor, Humour, Latvia, Travel and tagged expat, Festivals in Latvia, Food, humor, Humour, Ice sculpting, Ice slide, International Ice Sculpture Festival, Jelgava, Latvia, Latvian men, The Baltic Times, Vodka, Winter in Latvia, Yummy Janis. Bookmark the permalink. 68 Responses to Linda in Wonderland? It’s Alice in Wonderland via the gritty reboot coming to theaters this Summer. Ice sculpting is a truly amazing art form, but down here in Florida, we keep it indoors so that we have a little bit more control over whether the ice is water or not. I thought that kind of guys like Yummy Janis were extinct in Latvia 😀 I guess I was wrong. There may not be too many more like him! I’ve been here almost 4 years and he’s the first! 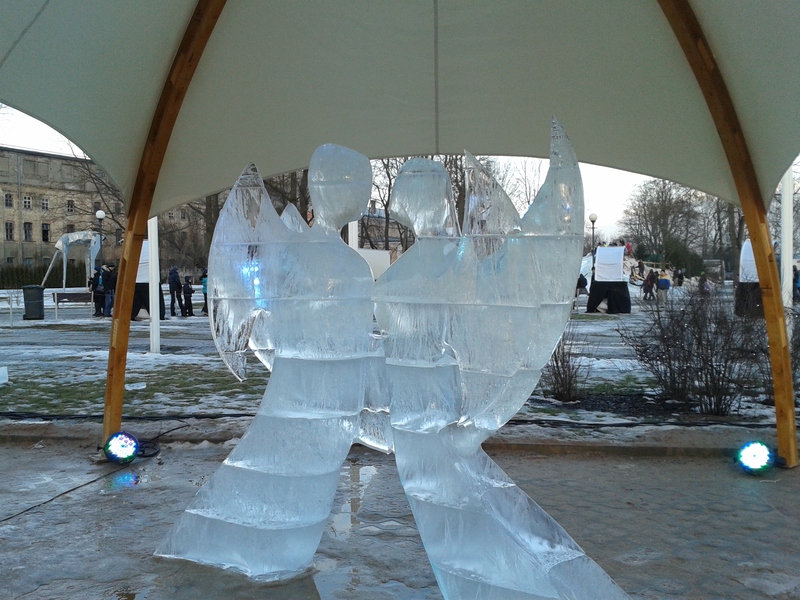 Unfortunate about the temperatures – the sculptures themselves look wonderful. Or they look like they would have looked wonderful, anyway. It’s good you’re not just encouraging hatred from a defined group of people, but from people in general. Makes me feel sort of warm and fuzzy about it. Congratulations to your journalistic debut “The Baltic Times”…well done! Thank you very much! Seemingly it did very well statistically so there may be more of them in future! … and also, oops, that should have been *recipe* … not receipt! No receipts wanted to keep track of any adult beverage purchases. So what was for dessert? Wonder what dessert wine Conrad recommends? We can run over and ask, but he’s out a bit til Monday so not sure when he will get back to us. We just kept drinking the same wine we had for starters 😉 We’re classy like that! Ahh ok. That works also. So this guy has a job, speaks in complete sentences, is yummy and cooks? Sounds pretty good so far I think. Does he live with his parents and wear onesie pajamas around the house?? As long as it’s nothing sinister. Carry on. If you start slurring your words, call 911. Ha, I bought 4 bottles for our first date!! 🙂 You would have been on the floor!! Yeah, you didn’t miss much to be honest! Your 7-year-old would have loved it though!! Plenty of puddles to splash about it when she finished on the slide! Is there a recipe for the hot cranberry vodka? In a blizzard here and need something to drink. Such a shame about the weather! I would be MORE than happy to send you any/all of the cold, snow and ice we’ve had here in my neck of the woods. This morning it was -11C when I woke up, and tonight into tomorrow we might get anywhere between 10 and 20cm of snow. 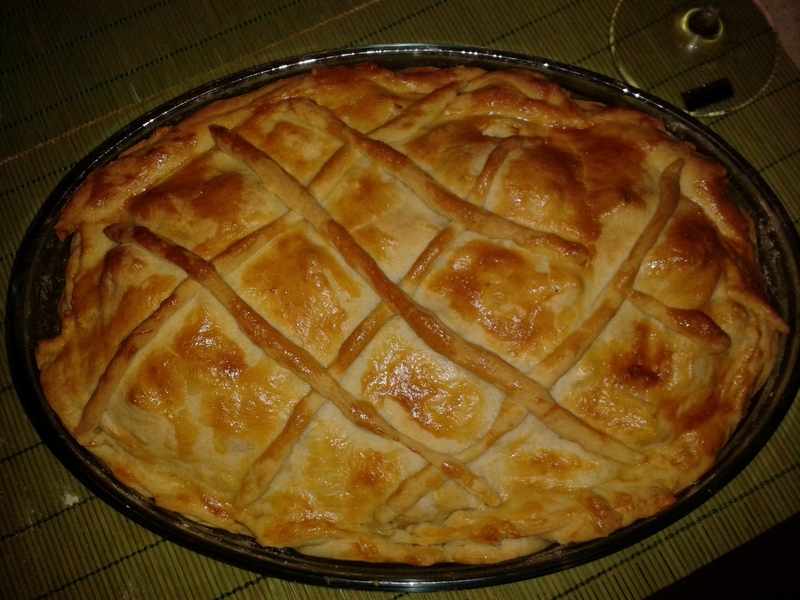 Anyway, still sounds like a fun experience, due to the good company, and particularly when topped off with a good drink and a beautiful savory pie! Wow, that is one attractive dish! BTW, I hope you’re planning on cheering on the Latvian hockey team in a couple of hours when they face Switzerland! Umm, maybe I’ll have it on in the background – I’ll be cheering on the inside though! GO LATVIA! 🙂 Ugh, your weather sounds awful – please don’t send it this direction! This is my first half-decent winter out of 5!! Too bad the sculptures were falling apart! At least you had Yummy to keep you company. 🙂 And that pie looks good! You lucky lady! Yeah, 2 spoons and have at it 🙂 It was truly delicious! Yup, it sure wasn’t the worst of days!! I think they changed the programme for Sunday as there were no sculptures left by then!! I clicked on the photo to enlarge it – one-eared Shrek and Donkey are really cute. You’re welcome as always! Yeah, the ice bar was almost as cool as the vodka 😉 If you were just getting a shot, you could have it in a special shot glass made of ice – obviously not suitable for hot vodka though! You’d broken your spare plate?! As in, you only had the one?! Pity about the warm weather – the show probably would have been spectacular if you’d had the clear blue skies and sub-zero temperatures typical of this time of year. At least the drinks and food were good! Ha, I put in the plate bit just for you! Yeah, I had 2 – one for emergency guests 😉 I guess if I ever throw a dinner party, I’ll need to stock up a bit 🙂 I actually bought 2 but broke one as soon as I took it out of the bag – maybe I’m not meant to own more than 2 plates at any one time. I have plenty of glasses though! Yeah, it’s good motivation! There are never dirty dishes around the place! Aww, poor sculptures. Seeing them all melty and earless would have made me sad. I would definitely have had a go on the slide! It really was! I just finished it last night 😉 It got better each day! Cranberry vodka at an ice bar sounds AMAZING. I’ve been meaning to hit up Moscow’s ice sculpture show, but afraid of the same sort of letdown – it’s been very warm here too. 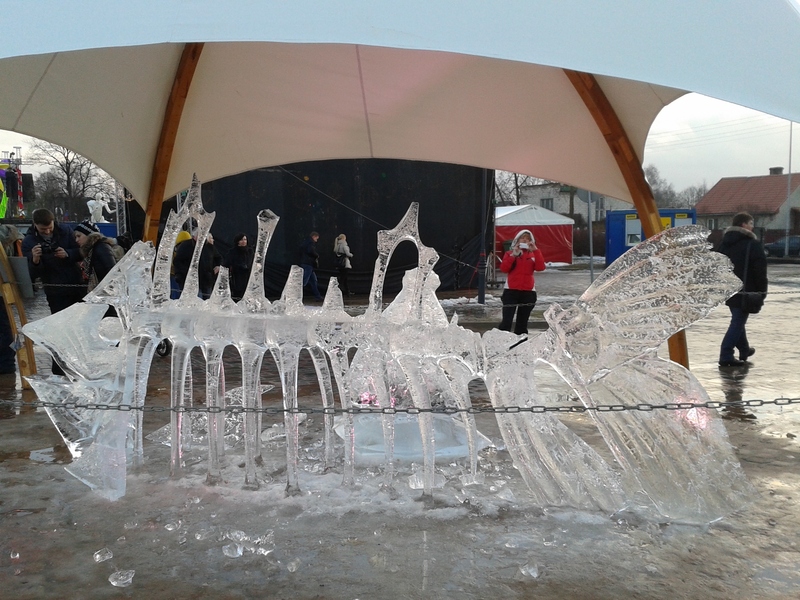 All those melty sculptures looked so sad…that fish carcass seems a very fitting emblem. Yeah, I thought so. There were some even worse ones but that one had just the right level of sadness 🙂 You can always drown your sorrows at the ice bar anyway – I’m sure they’ll have one too! They no longer sell vodka at outdoor events attended by children! What is the world coming to? And morals and family values… I dunno, I think they’re all high. The world has clearly gone mad.